Sweet caramelized onions and apples, smokey bacon and creamy fontina cheese with whole wheat dough. This caramelized onion, apple and bacon flatbread pizza is a delicious meal or appetizer for the thin crust pizza lover. Today is pizza pie day or National Pizza Day, either way, it’s a great reason to eat pizza. I know, it seems that there’s a food holiday for everything now, but you must admit, today is a good one. I like to use whole wheat flour for this recipe because I think it just gives the dough a great nutty taste. Now, this is not your average pizza dough, because there no yeast. The reason there’s no yeast is because it is flatbread and I don’t want the dough to rise I want it to stay thin and crisp. The recipe for the dough makes 2 – 10 x 5 inch oblong flatbreads, which is enough for 2 people. The other half of the dough can be frozen for later use. I love the combination of the sweet caramelized onions along with the sweet apples. I love using apples in savory recipes because it brings out their natural sweetness when you cook them. I discovered this when I made maple glazed sweet potatoes and apples. With crispy, smokey, salty bacon, the flavors all all complement each other so well. I used fontina cheese because it’s very creamy and it melts really well. In a large mixing bowl, sift the flour, salt, and baking powder, mix well. If the dough is too dry and more water, 1 tablespoon at a time until the dough forms a ball. To a sauté pan over medium heat add the olive oil. Cook the bacon until just browned and crispy, drain onto a paper towel. Set aside. Reserve the oil, and return the pan to the heat and lower to medium low. Add the butter to the pan, then add the onions. Cook the onions until they start to brown, about 30 minutes, stirring every 5 minutes. Add a pinch of salt and stir. Add the apples to the onions and continue to cook until the apples soften. Set aside. Remove the dough from the fridge about 10 minutes before using to allow to come to room temperature. Do this while the oven is preheating. To a large cutting board or countertop dust with flour. Roll out the dough to your desired shape, I like oblong. Place the dough onto the baking sheet and bake for 12 minutes. Remove from the oven and add the toppings, sliced cheese, onions, apples and bacon. Return to the oven and bake until the cheese is melted, about 8-10 minutes. Top with chopped Italian parsley (optional). This looks delicious! Great for fall weather! (course, I wish we had cooler temps here is CA, but that’s what we get, right!) I love the combination of caramelized onion and apple on this! Love this idea of a flatbread. I love the taste combination of Apples and Onions. It’s all about caramelized onions today in my world and this flatbread recipe is PERFECT. I’m a huge flatbread fan and your flavor combinations sound absolutely delicious. I featured this recipe onmy page and it was a big hit! Oooh man does this sound good or what? Thank you for sharing with us at The Wednesday Round Up and we hope to see you back next week! I love anything pizza, flat bread or whatever resembles to them! I bet the caramelized onions make all the difference here! I just love that you’ve combined apples with the wholemeal dough here. Seems to make perfect sense to me. Apples and nuts = a perfect combo! And with that lovely oozy melty cheese, too, I think I’d be in heaven eating this for dinner! Wow! Amazing flavors here and it’s gorgeous to boot! Well done, Janette! Great combination of flavors Janette! I love flat bread pizzas! Pinned! This is a classic combination of flavors. Love it. Wish I new it was National Pizza day, I could have made a pizza for supper instead of being in the kitchen for 3 hours making a big dinner. :). Pinning/sharing. What a beautiful pizza! Love the combination of flavours and the crust looks so tasty too! This looks so good! I’d love to make this and cut it into small servings for a Happy Hour party. Thanks for the awesome idea! Looks great and everything from scratch. 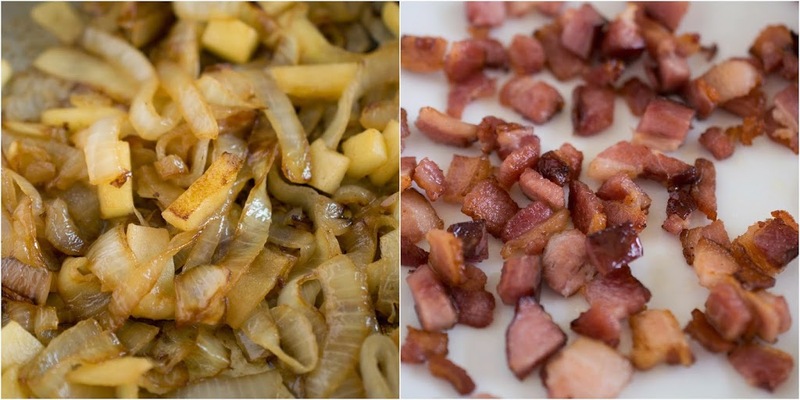 I love caramelized onion and bacons, but the apples. That is new to me, totally need to try it! This sounds like an amazing combination! I can’t wait to try it! This looks amazing lady! Great job! this is such a coincidence Janette! I just published a pizza with caramelized onions a couple hours ago. great minds think aline I guess 🙂 I love how you did sweet-sweet-salty with the apples and bacon too mmmmmmm! I know, I said the same thing on your post, which looks amazing. Oh my gawd!!!! I absolutely love the combination of caramelized onions and apples! And then you added bacon too! Oh my, I would totally devour this flatbread pizza. The combination of flavors going on in this pizza is just wonderful. I gave you the fullest amount of love from the blog and grabbed the link and photo to share on G+. YUM and SU included! Great job with this! These are exactly the kind of flavors I love. This is beautiful and I bet delicious! Those are some of the best pizza toppings ever! LOVE this!